Good Choice Reading: TQOTD - Do You Journal? TQOTD - Do You Journal? It is the perfect gift for me because I love journals - in every way, shape and form. I actually find that all of my friends who love to read also like to journal. Thursday's Question of the Day: Do You Keep Some Form of Diary or Journal? I started a journal at the age of 8. And I have kept on going throughout my years. I have a bunches of different journals. And I asked my brother and his wife to please keep it away from my son if something were to happen. LOL. I have a journal but I NEVER ever write in it. I don't even know why I have it to be honest. The last time I updated a journal was before my son was born seven years ago. I probably should keep one now of what my life is like today LOL! Im not sure you would call my notebooks journals, I have never broke down and bought a proper journal, nor do I know if the content can classify as journal material at all times. I do write in it daily, be it a quote, or a song lyric, or a thought. Rarely is it my thought. Mostly inspiration I get from other people along my path in life. I used to keep a diary but I don't anymore. I do keep a few papers that I update every summer with my goals and favorite thinks at the time. I use to when I was a kid. I just started to again, mostly to jot things down about my daughter. My mother in law has some from when my husband and siblings were young and it has been fun to hear about when they hit different milestones. Time is just going so fast it will be nice to have a written record of some of it. I have several journals from when I was younger. 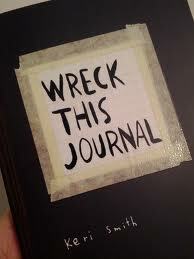 I also have one that I started about a year ago but I don't write in it nearly as often as I would like.